Comprising of partly evacuated glass bulb approx. 70mm dia. containing at its center a fine pivot which supports four light weight metal arms. One side of each vane is blackened, the reverse side is bright. Mounted on round base, when exposed to sunlight the vanes rotate. Single detector with dual sensors measures both ultraviolet and visible light. Complies with ASTM specifications for MPI and FPI. Specially engineered for NDT applications. Silicon Carbide (SiC) Photodiode packaged on gold plated header via gold wire bonding under UV glass window cap, hermetically sealed. Filter: Metal Oxide Eeff (erythemally effective) and teflon diffuser cap. 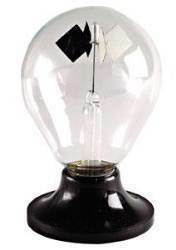 We provide Crookes Radiometer. Comprising of partly evacuated glass bulb approx. 70mm dia. containing at its center a fine pivot which supports four light weight metal arms. One side of each vane is blackened, the reverse side is bright. Mounted on round base, when exposed to sunlight the vanes rotate. 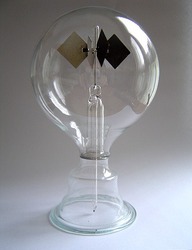 Dome net radiometer based on thermopile, for reference measurements of net radiation. The earth's ozone layer plays a very important role in protecting living organisms by absorbing the harmful ultraviolet (UV) radiation. However, the ozone layer became thinner and thinner over the years even though it started to level out during the last decennium. -sensor to measure uva radiation with wave lenght 315-400 nm. *sensor to measure uvb radiation with wave lenght 280-315 nm. *sensor to measure vir radiation with wave lenght 745-815 nm. Science and beauty of the power of the sun come together in this apparatus. The highly sensitive vanes are carefully balanced inside the radio meter. When exposed to sunlight or an incandescent bulb, the dark side of the vases absorb heat where as shiny side of the vases emit the heat. This forms a couple effect because of which the vanes rotate swiftly. MKS-UM is a full-range radiation survey equipment capable of being used in a battle field environment. MKS-UM has been designed on the basis of its predecessor MKS-U, which gained an excellent reputation working in extreme desert conditions, during the United Nations peacekeeping mission to Iraq and Afghanistan. Nushka Sensors & Technologies Pvt. Ltd.